Concrete has been one of mankind’s great inventions, used throughout much of history and around the world. The use of concrete as a building material goes back to roughly 6500 BC. Many of mankind’s greatest architectural and engineering accomplishments could not have been done, without the use of concrete. Modern concrete consists of aggregate (rock, gravel and sand) bound together by a fluid cement that hardens by chemical reaction with water. Mixed into a slurry, concrete can be molded into a nearly infinite variety of forms, limited by the imagination of the user in creating a form or mold. For some structures, concrete is reinforced with steel bars, called “rebar” which is short for reinforcing bar. This is necessary because concrete, like most stone, is strong under compression, but not under tension. In other words, it is much weaker when you are trying to stretch it, than when you are trying to compress it. This is essentially what you are doing, when you use a hammer and chisel to break concrete or stone. Stair dimensions are labeled with two terms; rise and run. The rise is how high each step is and should generally be six to eight inches for comfort. You can go outside those dimensions, like a 5” rise, but if you go too high, the steps become hard to navigate, especially for small children and the elderly. The run of the step is the distance from the step’s edge to the back of the step. This should be at least 11 to 12 inches, so as to ensure that it is enough for people to get their whole foot onto. You want to make sure that you keep both the rise and run of your steps consistent. Uneven steps cause people to stumble. So to determine your rise, divide the total height of the stairs by 8, and then round up. Now divide the total height of the stairs by the answer you got when dividing by 8. This will give you the rise for your steps. Typically, you can make the total run of your steps as long as you need to. So, start by figuring a porch or landing, if you need one. If these steps are going directly to a door, you’ll need at least a 36” deep porch or stoop. Add the total number of steps you need to that, in order to find your total run. The final dimension you need is the width of the steps. If this is leading to a door, you will want six inches of space on either side of the door. So a typical 36” exterior door should have a 48” wide staircase leading up to it. Of course, if your steps are leading up to a porch or other structure, you can make them as wide as you want. Just be sure to make them wide enough to be easily navigable. Concrete is heavy, about 4050 pounds per cubic yard or 150 pounds per cubic foot or 2400 kilograms per cubic meter, so your steps will be heavy. Therefore, they will need to sit on solid ground. You never want to pour concrete on top of soft ground or existing grass, as that doesn’t provide a firm foundation. Rather, you want to remove the grass and the softer earth under it, so as to get to the harder ground underneath. Compact this harder ground with a hand tamper to give you a solid base to work with. It is a good idea to dig deep enough so as to allow you 4 to 8 inches of depth that you can fill with large gravel or crushed rock. This will help protect your concrete steps from shift in the ground, caused by moisture changes and freezing. Compact the gravel once again. In cold climates, it’s a good idea to put down a 2 inch layer of closed cell Styrofoam, beneath the gravel. This provides a water barrier between the steps and the ground, preventing freezing water from damaging them. With your site prepared, you are now ready to make the form for your concrete steps. Start by laying out the profile of the steps on a piece of ¾” construction grade plywood. Slope everything slightly (about 2 degrees) away from the door to help drainage. Double check your dimensions and then cut it out. You will need two identical pieces like this. Be sure to cut exactly on the outside of our lines. If your cuts are not straight and clean, sand them to clean them up. Irregularities in the profile you are cutting out of the plywood will end up as irregularities in the top of your steps. 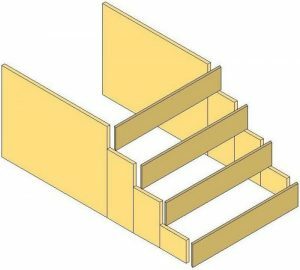 You will also need to cut as many strips of ¾” plywood as you have steps; as long as your steps need to be wide, plus double the thickness of the plywood. So a 48” wide step with 7” rise will need a piece of plywood 7” x 49 ½”. These are to be screwed to the front of each step on the plywood profiles, leaving the top of the step open. Be sure to screw the form together with long screws, as it must hold the weight of the concrete, while it is setting. The form must be placed where you want the steps to be and anchored in place. Use 2”x 4”s, pointed at the bottom end, to hold the form in place, with additional pieces of 2”x 4”s as angled braces, to keep the sides from spreading at the top. If anything, you want to overdo it on the bracing, as fixing any mistakes with concrete is extremely difficult. Before pouring the concrete, coat the form with oil to help prevent the concrete from sticking to it. Some people leave this step out, but in doing so, they often end up with splinters from the wood stuck to their steps. You may want to add some filler inside the area, to help take up space and reduce the amount of concrete you need. If you have rocks sitting around your property, they make excellent filler. You can also fill it with dirt, creating a well packed down pile in the middle, but leaving at least four inches of space all around. It is a good idea to add some metal reinforcement inside your step, before pouring the concrete. This can be done with rebar or remesh. Remesh is a stiff, welded wire grid, which is often used in pouring concrete patios, sidewalks and other light-duty structures. It will work ideally for steps as well. The rebar or remesh needs to be suspended in the form, so that it will sit below the surface level of the steps, but not sit on the ground. Ideally, you want it 2 to 4 inches below the surface. Now that everything is ready, you can mix your concrete and pour it into your form or call for a truck to deliver ready-mix concrete to your home. As a general rule of thumb, if you need more than 20 bags of concrete, you’re better off getting ready-mix, than trying to mix it yourself. Fill the form all the way, flush with the top, starting with the bottom step and working your way up. You want to get rid of any air pockets, by a combination of spading the concrete, inside the form (to break open air bubbles) and tapping the outside of the form with a hammer, to vibrate it and get the concrete to settle. The concrete may settle, leaving low spots, as you pour it and tap the form. That’s okay, continue filling the form, then go back and top off any low spots with more concrete. By this time, the concrete will have started to stiffen up and should not sag again. 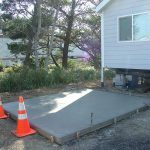 With your form fully filed, use a hand float to smooth out and level the surface of the concrete. You want to float it enough that the “cream” (excess water) rises to the top. Allow the bleed water to dissipate, then texture the top of the concrete by brushing over it with a stiff broom. This will help keep the surface of the concrete from becoming slippery when wet. If you are planning on edging your concrete, to give it a radiused edge, it is done at this time, using a steel hand edger. This is not a requirement, but provide a more professional finish to your concrete step. Once the concrete has set to the point where it will no longer gun, disassemble the form and remove it, starting by removing the riser boards. You should be able to do this about one hour after finishing your pour. Wait until the next morning to remove the side boards. If there are any air pockets or voids in your concrete, fill them with concrete patch material. Concrete does not dry, but rather cures. It hardens by a chemical reaction between the minerals in the cement and water. So you need to keep the concrete wet, while it is setting. It is best to keep it constantly wet for two to five days after pouring. By then, it should be fully cured.